Can British film star Mia Barlow and American novelist Paul Barton turn their unlikely friendship into romance in the City of Light? 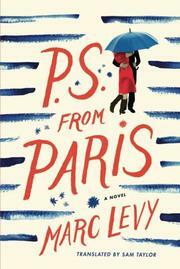 Falling in love in Paris should be easy, but unlucky Mia and Paul come with more baggage than their suitcases. Weeks before the opening of her blockbuster romantic comedy, the actress discovers her co-star husband is more lothario than hero. She escapes her domestic drama and runs off to Paris to visit her best friend, Daisy. Sporting a new hairstyle and glasses, Mia fills in for a waitress at Daisy's restaurant and manages to go unnoticed by fans. Soon she meets Paul, a reluctant literary phenomenon. He moved to Paris from San Francisco nearly a decade ago, partly to avoid the limelight of the American literary scene, and through a series of events that involve Mia snooping on Daisy's computer and Paul's friends trying to find a girlfriend for him without his knowing about it, he and Mia are matched up on a dating website. Their very blind date lends itself to the typical romantic comedy conventions of mistaken identity and miscommunication until they discover the ruse and decide to cultivate a friendship. As Mia decides what to do about her cheating husband and Paul contemplates a move to Korea, where his books are wildly popular, the two go through the requisite paces of getting to know one another’s charms and quirks. There’s a smileworthy if not hilarious scene in which the couple is nearly arrested for trespassing at the Opera House. While the plot is predictable, Levy (Replay, 2014, etc.) delivers a few fun surprises. We discover there’s more to Paul’s success in Korea than meets the eye. And the descriptions of Montmartre and the City of Light are also enjoyable, though nothing truly fresh or insightful. Breezy and fast-paced, this romantic comedy is a bonbon of delicious, albeit mostly empty, calories.